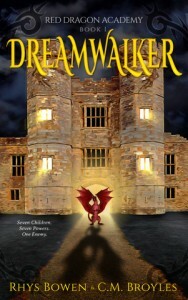 Dreamwalker is the first book in the RED DRAGON ACADEMY series that Rhys is writing with her daughter Clare Broyles. Clare is a talented composer of music/songs/opera and has now turned her talents to a delightful middle grade fantasy series. Addy is a normal California surfer girl until her mother dies and her British aunt sends her to Red Dragon Academy—a strange boarding school in the mountains of Wales. There Addy meets an assortment of kids who seem to have been lured to the school for some purpose. At first the school is odd but not unpleasant, until Addy discovers one hallway that leads not to another part of the school but to another world—a mirror universe called Gallia. This place is ruled by a terrifying being who controls minds. Addy has always had vivid dreams and now it seems that she is a Dreamwalker—a power most feared by the ruler who calls himself THE ONE. SEVEN CHILDREN. SEVEN POWERS. ONE ENEMY.